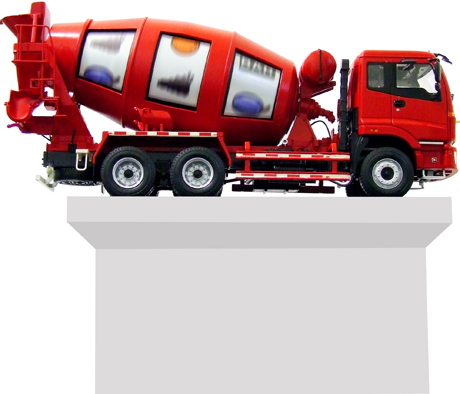 A mobile concrete mixer is stationed upon a raised plinth, its barrel adapted to resemble an over-sized jackpot display. Behind the windows in the barrel, three backlit reels spin independently, rotating with the languid speed at which cement is mixed to prevent it hardening in transit. Periodically the cylinder-reels halt and a programmed sequence of flashing lights emphasise the random combination of jackpot symbols, denoting the fruits of daily labour. Following on from Skip My Darling, an artwork that also makes use of a HGV, this sculpture similarly unifies aspects of employment and leisure familiar to working life. From an immediate position of spectacle, Pick N' Mixer signifies play, entertainment and wish fulfillment in the form of gambling; a humorous, unlikely monument to a legitimised and accredited aspect of British lifestyle. "Work hard, but play just as hard" or "Be lucky!" the seductive graphics on each reel convey to the viewer. Beyond its immediate visual impact Pick N' Mixer takes on a more considered tone, touching on themes such as the nature of employment and the possible fortunes of areas undergoing redevelopment. By visually combining the graphic language of gambling with the implied physical toil of mixing concrete, the sculpture is perhaps prompting the viewer to consider the fluidity of money and the cyclical nature associated with working life. Questions arise regarding the role that chance plays in determining an individual's socioeconomic outlook and the extent to which choice (suggested by the sculpture's title) is available to us in our lives. The duality of Pick N' Mixer asserts that financial fulfillment and social mobility is perhaps life's ultimate lottery.